Follow the logic here. The intrepid reporters over at AutoWeek are reporting that Ford is developing a new RWD platform for Lincoln and Ford. 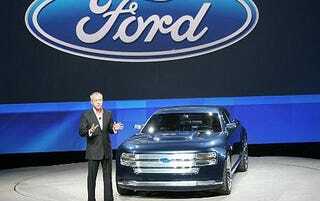 Derrick Kuzak, head of Ford global product, confirmed that modern RWD cars were in the picture, saying "Yes, we're working on a rear-wheel-drive plan for the enterprise." With the Detroit Auto Show coming around we can't help remember one RWD from Ford we were quite fond of it. Dear sweet loving God... please make it an Interceptor. Detroit Auto Show: Ford Goes Butch; The Interceptor Sedan Concept! !